Every status page comes with SSL termination when using a subdomain at status.io. For example: https://yourname.status.io would be encrypted using the *.status.io wildcard certificate. If you’d prefer to implement SSL using your own domain, you will have to prepare and upload your certificate. We use SNI for handling SSL connections to status pages. All modern operating systems and browsers support SNI. 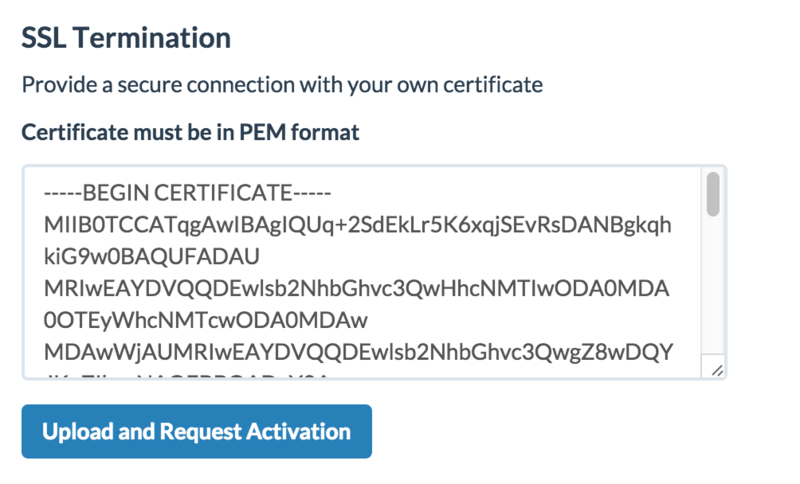 Your SSL certificate and key pair must be in the PEM format to implement SSL with your status page. The private key must match the public key that is in the certificate. The private key cannot be encrypted with a password. The private key also must be an RSA private key in PEM format. HTTPS connections require a minimum TLS version 1.1.